The potassium test checks the potassium blood level. A potassium test measures the potassium blood level. Why is a potassium blood test important? The potassium blood test screens for abnormal potassium levels. This Potassium Test is a blood test. The potassium test, also known as a potassium lab test, potassium level test, and K blood test, measures the potassium level in the blood. The potassium blood test requires a simple blood draw that can be performed by any standard lab. To get a potassium test near you, order online and visit the Quest Diagnostics lab you selected. 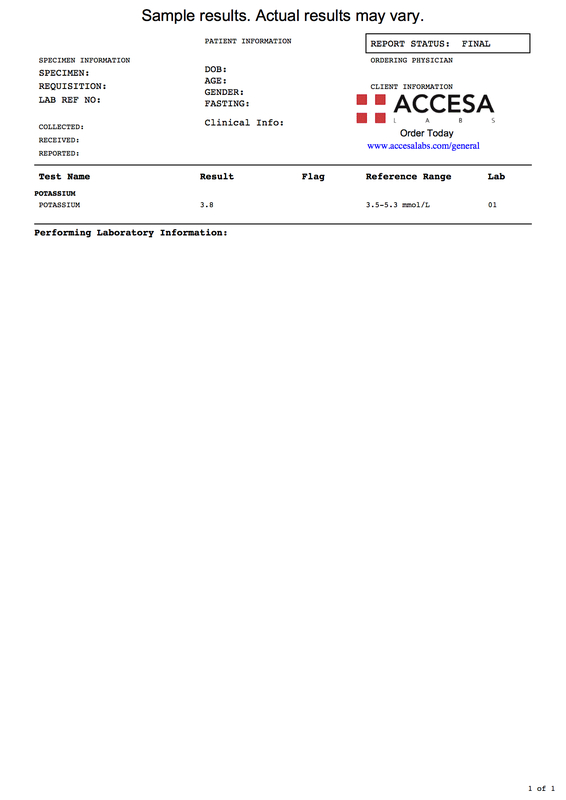 No fasting is required for this test and potassium lab results come back relatively quickly. The benefit of getting a potassium test performed at a lab is that a potassium blood draw needs to be performed carefully as inappropriately drawn samples can cause red blood cells to rupture, leading to something called hemolysis which can lead to artificially elevated potassium blood level results. Potassium test results are reported in mmol / L. In reviewing the potassium sample report above, the potassium level reported in the result column is 3.8. This level falls in the reference range provided by the lab of 3.5-5.3 mmol / L. While this would typically be considered normal, the clinical situation is always important with potassium levels and results should be considered in that context and in consultation with your personal medical provider. This potassium test measures potassium levels at a point of time in contrast to the potassium RBC test which measures intracellular potassium levels. Potassium Test at Guaranteed Prices.